Bargain Printing has the ability to create high-end catalogs up to 40 pages. We offer a variety of sizes to accommodate any project and budget. All catalogs are saddle-stitched (stapled) at the spine. We recommend full-color printing for higher impact catalogs, but we have the ability to match any Pantone® Matching System color of your choice. We work with a variety of papers from 80# text for affordable content pages to 12 pt heavy stock for impressive covers. Nothing takes the place of a well-produced catalog when you want to present your inventory or your services to potential buyers. Clear images accompanied by simple, clear text can encourage potential buyers to see your business in a new light. 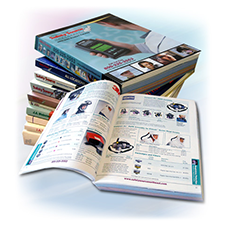 Have you thought about printing seasonal or promotional catalogs? If you have a big event coming up, consider producing a catalog your buyers can take with them. Send a catalog out to your trade show leads and takes your presentation one step closer to sales. Buyers can spend time reviewing your business, and you can organize the presentation in order to lead the reader to multiple sales, multiple orders, or regular, recurring orders. Catalogs are a great opportunity to make an all-inclusive pitch to buyers. Products can be organized to make shopping easy. Your readers will see their way to plus sales and added value and will be on the lookout for future updates and promotions. *All quantities below 500 may be done digitally. 5.5" x 8.5" 8.5" x 11"